The five points of pronunciation, for quick reference. Now we will study the last eight consonants. These consonants use the same points of pronunciation as the stops and nasals from the previous lesson. The consonants in this group are halfway between vowels and consonants. For that reason, they are called the semivowels, where "semi-" means "half." Like the vowels, the semivowels are voiced and unaspirated. Also, they are produced by continuous air flow out of the mouth. However, we produce these sounds by suppressing the flow of air at the point of pronunciation. The semivowel r has essentially the same pronunciation as the vowel ṛ. 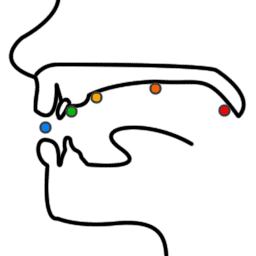 Each of the semivowels has a different point of pronunciation: ya uses the hard palate, ra is a retroflex consonant, and la uses the teeth. va is a bit different; it mainly uses the lips, but it also requires the use of the teeth. va is halfway between the English "va" and the English "wa." The consonants in this group are all varieties of the hissing sound that you hear in words like "Sanskrit" and "sherpa." For simplicity's sake, let's just call these the "s"-sounds. Just like the semivowels, the "s"-sounds in this group are produced by suppressing the flow of air at the point of pronunciation. But, these sounds are not like the semivowels, as you can hear below. The "s"-sounds are unvoiced. Each has a different point of pronunciation: śa uses the hard palate, ṣa is a retroflex consonant, and sa uses the teeth. śa and ṣa have no English equivalents. One reader has offered a helpful way to make the English "sh" sound more like the Sanskrit śa and ṣa. To better approximate śa, try saying a word like "petshop." Make sure to leave your tongue in the "t" position as you say the "sh" that follows. To better approximate ṣa, trying saying a word like "friction" or "hershey." Make sure to leave your tongue in the "r" position as you say the "sh" that follows. Your results may depend on your dialect of English. This sound is a voiced "h" sound, and it is very easy to produce. If you breathe out and make your breath voiced, you'll hear something like "haaa." That "h" is the same as ha. ha is the same breathy sound that you hear after the voiced aspirated consonants (gha, jha, ḍha, dha, and bha). ha is said to be pronounced at the soft palate. A sound like bha is not just ba + ha. It is its own sound, and it should not be confused with ha on its own. So, if some rule says "ha acts in this way," then the rule does not apply to bha or any other voiced and aspirated consonant. This is a subtle distinction that IAST makes quite confusing. As we move forward in our study of Sanskrit, we'll need some way to talk about specific groups of sounds. This is because Sanskrit sounds often change in very particular ways. If we use the right terms, it will be much easier to describe these changes. With that in mind, let me introduce the Sanskrit word varga, which means "division" or "category." This word is used to describe the consonant groups that we've just finished studying: the soft palate consonants, the semivowels, the "s"-sounds, and so on. To refer to one of these sets, we take the first consonant from the set and put it in front of the word varga. Since it's so simple to just put a letter in front of the word varga, you don't need to know seven separate terms: you can just use different letters, as you can see below. ha is considered to be a part of śavarga. But, you must remember that ha is different from the other letters in śavarga. ha is both voiced and aspirated, but the others are both unvoiced and unaspirated. For that reason, I'll usually use the term "s"-sound to refer to śa, ṣa, and sa. When ja is added to uda, we get a word that means "water-born," i.e. "lotus." So, what is the word for "lotus": udaja or udaj? The description is ambiguous because ja refers to both the consonant and some word meaning "born." For that reason, and from now on, this guide will refer to single consonants without the a sound that follows them. Our alphabet is almost done! Add the symbols above in order. A Sanskrit word that refers to a class or division of sounds. See above for the actual divisions.